May 1, 2014 @ 3:15 pm – May 16, 2014 @ 4:15 pm This May, Lei Hulu of Hilo will delight Museum visitors once again with a special exhibit of traditional Hawaiian featherwork by the students of Kumu Doreen Henderson, a master crafter of lei hulu. 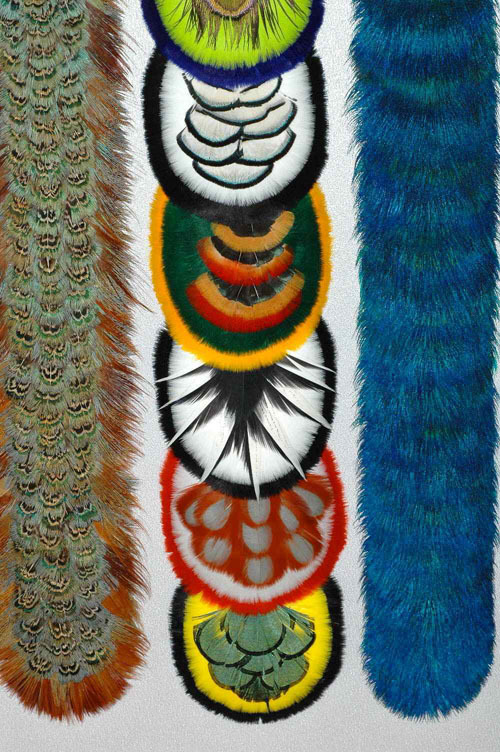 Examples of featherwork on display include lei papa (flat lei often used as hatbands), kāhili, `uli`uli (feathered gourds and rattles), `ahu`ula (feathered capes), and even an elaborate crested mahiole (helmet). Practitioners of lei hulu have traditionally used feathers from endemic birds such as `apapane, `elapaio, `i`iwi, mamo, and `ō`ō, but with these either endangered, or in the case of mamo and `ō`ō, extinct, they now rely on feathers from ducks, geese, guinea hens, peacocks, pheasants, and quail. Aunty Doreen’s own red-and-yellow lei kamoe (headband) is made up of “regular” goose feathers. Aunty Doreen learned the art from Kumu Mary Kahihilani Duarte-Kovich, herself a student of the late Aunty Mary Lou Kekuewa, one of Hawaii’s most renowned lei hulu practitioners and a second cousin of Aunty Doreen. An annual Museum attraction since 2006, this year’s special exhibit will be on display from May 1 through May 16, 2014.